In December 2016, the Intelligent Water Decisions Group had three PhD students participate in the prestigious OzEWEX Summer Institute. They discovered that the Summer Institute was really beneficial. Read on to find out why. What is the OzEWEX Summer institute? The acronym OzEWEX stands for the Australian Energy and Water Exchanges initiative. It is a group of partner organisations that together search for shorter, more effective ways of getting from new technology to better decision making. It has emerged because technology developments have led to new opportunities in observing and predicting Australia’s climate and water. New datasets coming from remote sensing and GIS occur so fast that they are waiting to be used by the research community. The 2016-17 Australian Climate and Water Summer Institute plays a key role in that search for opportunity. It was held in Canberra from 5 December 2016 until 20 January 2017. It gives students in Australia a unique environment in which to collaborate with their peers, and to work on projects that involve developing an application, or improving data services and analysis tools developed by the Summer Institute partners. Being a PhD student normally means that you will work independently (and sometimes in isolation) with your own research. You can freely work on your idea, and investigate the problem you are interested in with an almost unlimited timeframe (unless your scholarship is ending). The Summer Institute, takes the opposite approach. It requires you to work intensively in a team to try some ambitious ideas using new data and technology. And you only have four weeks. This situation makes you pay attention to the value of the common goal. Because you have to use cutting-edge climate and water data and tools in a limited timeframe, you focus more on how you can contribute to the success of the group. This means that you commit to the deadline, and support others using your own expertise. There are lots of online data tools and interactive maps online that are accessible to the public — but most people probably have no idea they exist! I certainly didn’t until I visited the Murray Darling Basin Authority (MDBA), Geoscience Australia (GA), the Bureau of Metorology (BoM) and the Commonwealth Scientific and Industrial Research Organisation (CSIRO) this week and heard all about them. Below are a few that we learned about. 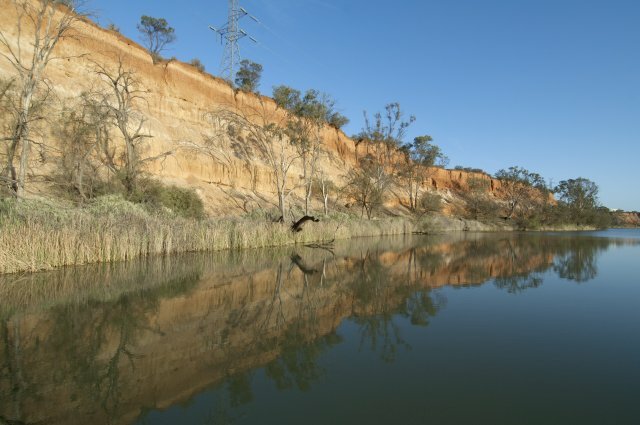 Want to know storage levels, flow rates and river heights for the Murray-Darling Basin? Head to the MDBA Live River Data website. Want maps of historical hazards such as cyclones and earthquakes, or surface water courses and catchments among many others? Check out GA Interactive Maps. Want river and stream data? The BoM Surface Water website shows flow rates and water heights for lots of different rivers and streams around Australia. The BoM’s Australian Groundwater Explorer shows you a map all of the groundwater bores in Australia and you can find information on groundwater levels, salinity and bore construction. If you’re looking for information and not sure if it even exists or where to get it, try the Data.gov catalogue. Benefit 2: Learn how to get out of your comfort zone. As a PhD student, you tend to have specific skill-sets that fit your own project well. This is not the case for the Summer Institute project. You are introduced to the most recent data products, state- of—the-a rt technologies and most recent frameworks. From these new things you will develop research ideas and identify the appropriate dataset, tools and technologies to make your ideas become reality. Then, even if you do have the technique to solve one specific issue, you may still need to speed up your process so you can meet the limited time-frame. This means you have to get out of your cave! You have to find new approaches, learn new techniques (e.g. running your code on a super computer), and use different datasets to make progress. Fortunately, there are several peers and experts to help you progress in a much shorter timeframe than it would take if you were just finding information on Google. As you progress through the course, your confidence builds. Then, you accomplish a task that seems impossible. Accomplishment is always empowering. The two most interesting studies for me during the first week were the flood inundation mapping and groundwater locating. I learned that satellites are being used to provide information and data for lots of different studies. Visual inspections (human or computer aided) can help reveal where water is (above and below ground, in normal conditions and floods). Radar can be used to distinguish between different landscape features, for example vegetation, soil, water, snow and rocks, based on the wavelengths reflected in the signal. The OzEWEX Summer Institute experience helps you to grow your confidence and to develop good decision making skills, especially when you have limited time. One of the most important lessons of the summer institute is that you should ’fail soon and fail frequently’, rather than fail late. By failing early and iterating, you achieve (at least) some preliminary results when the camp concludes. The summer institute is also a good place to learn how to make scientific decisions, because you have the opportunity to communicate with many experts. These people come from a range of different organisations. Some are decision-support agencies (e.g. Murray — Darling Basin Authorities), some are government agencies (e.g. Bureau of Meteorology), some are research institutions (e.g. CSIRO). They can all help you to get a bigger picture, and to get enough information by which to decide the best route for your project. This helps you not only improve your decision-making skills, but also to identify research outcomes that fit public demand. Measuring environmental impacts and benefits is often difficult, which is why satellite imagery and flow gauge measurements have been matched up to help determine Specific Flow Indicators (SFIs). Specific Flow Indicators are flow values in water courses that will provide a particular environmental benefit. They can be used in developing and assessing the effectiveness of environmental flow regulations. An example of an SFI is: To maintain a river red gum forest, a flow of Q ML/day is required forn days. For the case study, images from the Landsat satellite were used to determine the extent of flooding for particularflow events in the lower Balonne and middle Darling Rivers. This allowed SFIs to be developed based on how much inundation occurred over the flood plain. The technique works best in areas that aren’t too dry, don’t have too much cloud cover, and have good flow gauge data. Finding groundwater in the Australian landscape can be difficult, particularly in remote areas. Several different factors may suggest that groundwater is present in an area, and these may be measured by satellites or low flying planes. These indicators are most telling in areas with little to no rainfall, for example, mound springs in outback South Australia. The structure of the summer institute gives you two weeks of ’bootcamp’, followed by project execution for another four weeks. During the bootcamp, you will gain a deeper understanding of the role and workings of different government agencies. You will also participate in the annual OzEWEX national workshop, and receive intensive training and mentoring that will increase the chances of success in your four-week project. Here is a bit of a diary of what the first week of bootcamp involved. It is intensive, and intensely interesting! 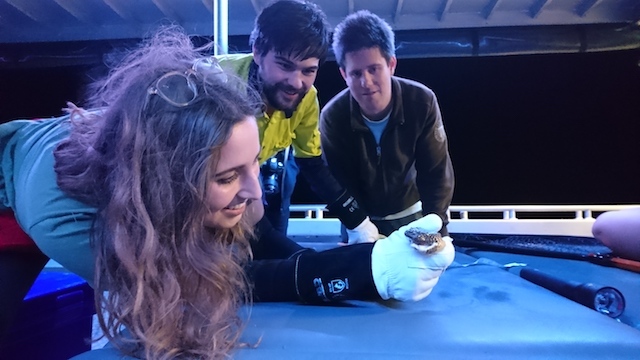 Week one of OzEWEX 2016-17 were immersed in site visits, talks by prominent researchers, and information. Here is a run-down of what this looked like. Introductory day. We were given an introduction to the OzEWEX Summer Institute by Albert Van Dijk (ANU). We met leaders from OzEWEX and sponsor organisations, including Norman Mueller from Geoscience Australia: Francis Chiew and Luigi Renzullo from CSIRO; Adam Steer from NCI; and Seth Westra from University of Adelaide. Had an opportunity to meet other fellows and hear about their research ideas. They ranged from drought to flood assessment with the use of remote sensing technologies to gauge-based analyses. Darling Basin Authority (MDBA), with Ian Neave, Tony McLeod, Joe Davis, Joel Baily and David Weldrake. From the MDBA we learned about the history of Murray Darling Basin management and the Basin Plan (2012). You can see where water is going on the MDBA live data website. We visited Geosciences Australia, where we learned about satellite remote sensing — ’WOFS’ (Water Observations from Space), the Foundation Spatial Data Framework (not live yet), topographic data systems, and hazard modelling. We visited the Bureau of Meteorology, where we learned more about water data. Australia has the most variable streamflows in the world! On the last day of Week 1 we visited the CSIRO, where we learned more about infomatics and land use. What did we get out of OzEWEX 2016—17? All three of us came out of the OzEWEX Summer Institute this January well-aware of the unsolved water-issues. We have also come up with fresh ideas that will help us tackling these challenges. But the most valuable thing we gained from the experience was outstanding support from our peers and other experts across Australia. This support is what will help to make our project outcomes publishable. The summer institute gives you the unique opportunity to strengthen your network. As an institute fellow, you will collaborate and begin long-term relationships with peers from across the country. You will meet and be mentored by Australia’s most prominent researchers and practitioners. And you will take on an ambitious challenge with a national profile. What you take away with you is the experience of the collaboration, and the peer and mentoring relationships. Ultimately, these relationships will help you to achieve greater success in your scientific career. Hong Do, Lisa Blinco, and Nhu Cuong Do are PhD researchers in the Intelligent Water Decisions Research Group at the University of Adelaide. If you would like more information, or would like to contact one of them, please get in touch. This post originally appeared on Intelligent Water Decisions. This entry was posted in Conference, Events, PhD Opportunities and tagged Intelligent Water Decisions, OzEWEX, seth westra, Water. Bookmark the permalink.